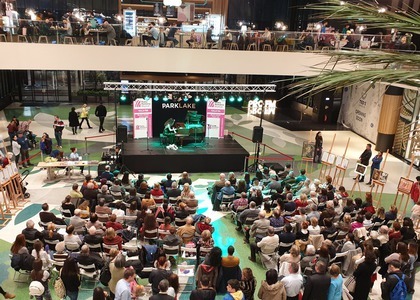 On the first day of spring - which happens to be Frederic Chopin's birthday - Radio România Muzical organized a recital performed by pianist Sînziana Mircea, hosted by the ParkLake Shopping Centre. Romanticism remains one of the universal musical reference points, and Frédéric Chopin's creation is a representative example of this kind of music. Thus, the idea of a recital celebrating the birthday of the Polish composer and the beginning of spring can be explained both through the accessibility of the program and its popularity. On the stage placed in the Main Square at ParkLake, the young pianist Sînziana Mircea delighted the public with waltzes and nocturnes by Frédéric Chopin, grabbing the attention of even the most hastened passers-by. The next event organized by Radio România Muzical on the stage of ParkLake will take place on the 24th of March, on the occasion of Classical Music Day. The concert will be held by cellist Alexandru Tomescu and the Radio Children's Choir, under the baton of Răzvan Rădos.